The Florida Keys boast the largest living coral reef in the Western Hemisphere. This unique phenomenon lies about six miles offshore in only 20 to 30 feet of water and stretches from near Miami in the Atlantic Ocean southwest along the Keys in the Florida Straits and out to the Dry Tortugas In the Gulf of Mexico. 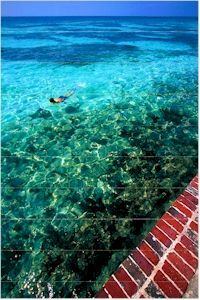 The shallow waters surrounding the Tortugas, warmed by the Gulf Stream, provide snorkelers with an almost unparalleled view of the phenomenon that is the reef. We have all heard about the reef, its fragility and its beauty, but just exactly what is it? Where did it come from? Why do we call it a "living" reef? The reef, properly named the Florida Reef, is made up of layers of calcium carbonate secreted by coral polyps over a period of several thousand years. The polyp is tiny and soft-bodied. New polyps are constantly being grown by the reef, but at the rate of only about one-half inch per year. Each polyp contains an algae called zooxanthellae, which gives the coral its color. The zooxanthellae takes in carbon dioxide, processes it, and gives off oxygen that the polyp needs to stay alive and to create coral. Touching the coral can destroy the polyp and leave the coral susceptible to bleaching and disease. That explains why a ship going aground on the reef is such an ecological tragedy. Today's snorkelers and scuba divers are cautioned to "look but don't touch". Seagrasses and mangroves are important to the coral ecosystem that includes the reef. Mangroves have roots that sink to the bottom of the ocean and provide a brooding ground for birds and marine life that migrate to the reef. They also provide nutrients and filter pollutants from the landbase. Seagrasses provide foods and serve as a nursery for pink shrimp and lobster, among other sealife. They also release necessary oxygen. The course of the Yankee Freedom II follows the reef past tiny keys with such names as Man Key, Woman Key, Boca Grande, and Mule Key. Then on to the Marquesas Atoll, site of the wreck of the Nuestra Senora de Atocha, where In past centuries pirates lay in wait for galleons filled with gold and other valuables. Passing through the Quicksands and past Rebecca Shoal, the Yankee Freedom II arrives at the cluster of tiny islets that make up the Dry Tortugas.